Thanksgiving is an enjoyable meal, but, in many ways, it’s more about the company than the food. I love what can be created from Thanksgiving leftovers. A 28-pound turkey for 9 people was no mistake. I was planning for leftovers. On Friday, we had repeat Thanksgiving for lunch and dinner, that is, turkey, stuffing, mashed potatoes, veggies, and, for me, pink jello mold. Now, it’s time to move on to creative use of leftovers. The day before Thanksgiving, I always make a pot of turkey stock from any turkey parts in the freezer. Usually, I use the stock for the gravy and the stuffing, to maximize the turkeyness. Any leftover stock can be used to make turkey soup. As I mentioned in my Thanksgiving post, we ended up with a tremendous amount of liquid in the roasting pan. It was enough for the gravy and the stuffing, with more left over. That leaves 6 quarts of day-before turkey stock in the refrigerator! 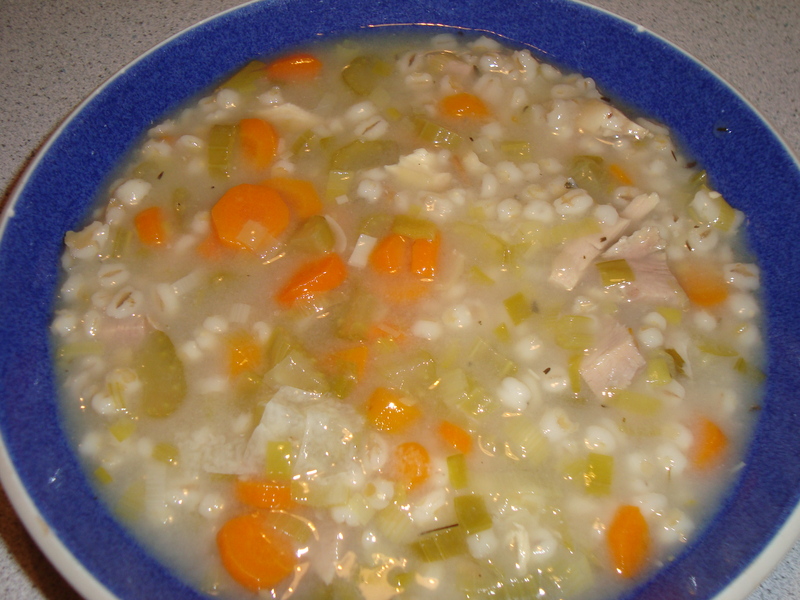 Combine vegetables, stock, and barley in a soup pot. Bring to a boil. Reduce heat, and simmer for 1 hour. Barley should be tender. Add turkey, stir, and heat until turkey is warmed up. Serve. Parsnips, sliced like the carrots, or quartered mushrooms are nice additions. Substitute 1 cup dried orzo for the barley. Don’t add at the beginning, but after about 45 minutes. Cook until tender. Then add the turkey. Another thing I like to make with Thanksgiving leftovers is turkey pot pie. My recipe has evolved over many, many years of leftovers. This is where any leftover vegetables usually end up. The gravy too, though I often need to make more gravy to have enough. 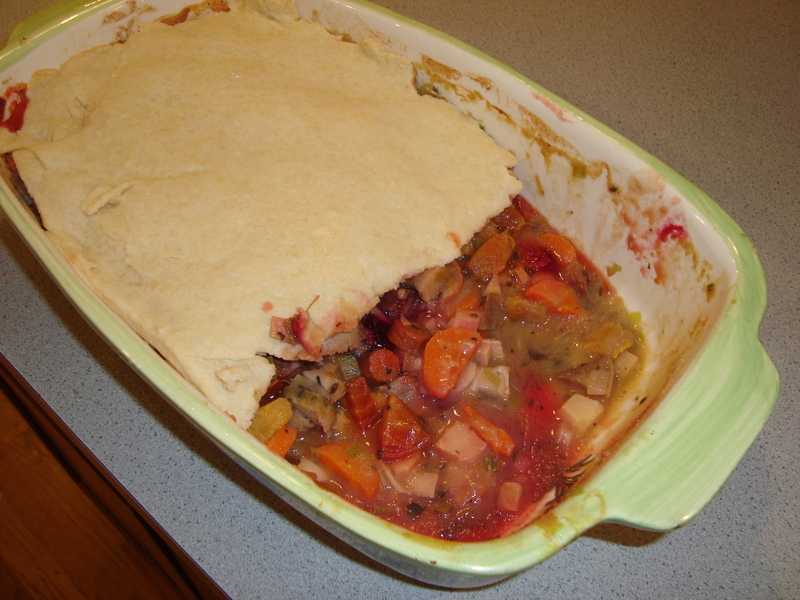 My pot pies have a lot more vegetables than meat because that’s my preference. You could adjust according to your own tastes. In a large pot, melt the butter, and sauté the leeks until tender (about 5 minutes). Add remaining ingredients, and stir gently to combine well. Pour filling into a 3-quart baking pan, and smooth the top. On a lightly floured surface, roll out the pot pie topping to the size of your baking pan. Place the topping over the filling. It doesn’t have to cover exactly. Bake for 30 minutes, until filling is bubbling and the topping is lightly brown. In a medium saucepan, whisk the flour into the hot fat. Whisk until lightly browned, about 3-5 minutes. Gradually whisk in turkey stock. Continue to whisk until the gravy thickens, about 5 more minutes. In the food processor, combine the dry ingredients. Add butter, and process until the butter is cut in. The mixture will resemble corn meal or coarse sand. Add the milk, and pulse until the dough comes together. On a floured surface, gently knead the dough a few times before rolling it out. Posted on 29 November 2009, in General and tagged soup, Thanksgiving, Vegetables. Bookmark the permalink. 1 Comment. Dear Betsy: Read your recipe for ;turkey pot pie and it would be perfect for our (in the works) herbal cookbook. The Staten Island Herb Society uses it as a fund raiser. Do I use your name for credit on the page or another source? Am entering Laury’s sweet potato pecan pie.